It occurs to me that I haven’t even written a blog post about it yet, but the crowdfunding pre-sale campaign for my debut novel, JADA: MOUNTAIN WARRIOR is ten days in and already a roaring success. 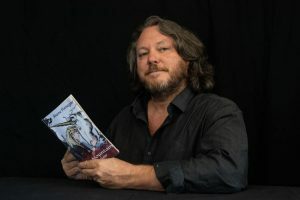 The campaign was designed to fund an initial print run of paperbacks of the novel, and we have already raised enough to pay for that, pay for the cover art and the incidental campaign art as well. SINCERE THANKS to everyone who has contributed so far – you’ve helped me realise a childhood dream. That doesn’t mean it’s time to stop now – oh no, no no! Now is the time to GO BIG! Since we have just cracked AUD $5,000 (woo hoo!!! 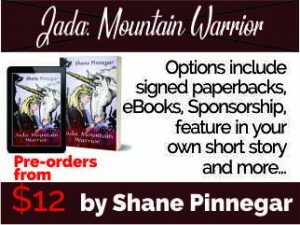 ), I am going to print some cool bookmarks featuring the Jada cover art, and every physical order will get one with their book as a special thankyou from me to you. I want to make this the best damned book it can be, as well as provide some incentives to keep the campaign rocking and rolling, so I have thought up two major stretch goals. So, please encourage your family and friends and that bloke who works in the corner store and the lady who lives across the road and your Rotary Club and your footy team and.. you get the idea… to buy a copy, or share to THEIR friends and family and so forth. If you know anyone who runs a school library, or a bookstore, and would like to purchase a copy – please don’t be shy to share it with them. My second novel is finished – well, the first edit is, anyway! I have a few other projects underway, too, so you can expect to see more shelf-fillers from me in the next twelve months, but more on that next time.